We all know the impressive silhouette of the great Mountain Huayna Picchu that has made of Machu Picchu a world icon through the magnificent photographs spread over the Internet but very few have climbed its rock cliffs and enjoy a unique view of the Inca City of Machu Picchu. What do we find climbing Huayna Picchu? 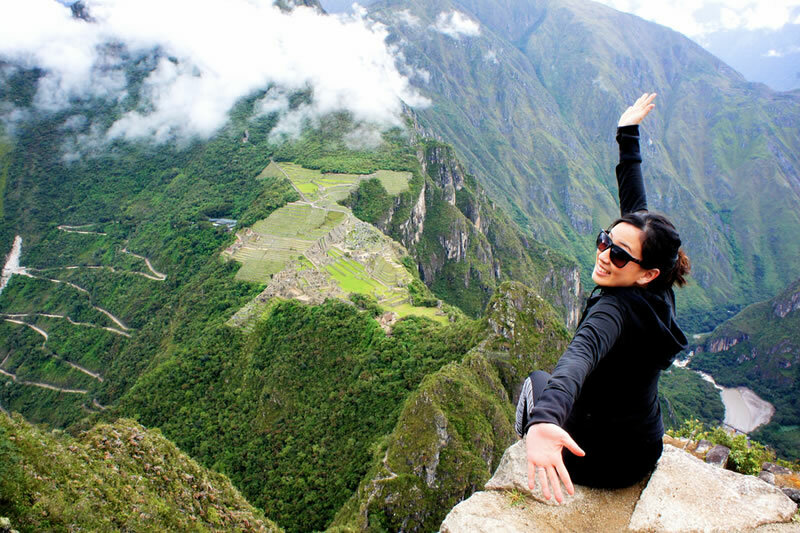 Can you explore Machu Picchu and climb to Huayna Picchu in one day? What is Huayna Picchu’s difficulty? What is the best time to go up to Huayna Picchu? Do I have to book Huayna Picchu before? Are there age restrictions for Huayna Picchu? The Huayna Picchu Mountain is located north of Machu Picchu Mountain, at an altitude of 2693 masl It forms part of the orographic formation known as the “Batolito de Vilcabamba”, which is an extension of the Andes Central Range. Huayna Picchu, in Quechua means Young Mountain and forms part of the three sacred mountains existing in Machu Picchu, that is to say; “Mountain of Machu Picchu” or Old Mountain , “Mountain Huayna Picchu” or Young Mountain and “Mountain of Putucusi” or Mountain Alegre. From the top, this mountain has a spectacular view of the Inca City of Machu Picchu, roads, bridges, the Sacred Gate of Inti Punku, where you enter the Inca Trail. For all these reasons, Huayna Picchu is credited with a monitoring and surveillance function. For the ascent, this steep Mountain has a narrow road with stretches that include, stairs carved in the same rock. During the ascent, there is a landscape with thick vegetation typical of the jungle. Also, in the interior of a cave, architectural evidences that belonged to the possible Temple of the Moon, the same that counts on niches or niches and walls Incas. It should be noted that the mountain is surrounded by andenes or terraces, which served as containment and for agricultural purposes. The Inca City of Machu Picchu, has a height of 2430 msnm and the Huayna Picchu is 263 meters higher. The Huayna Picchu is a steep mountain, but less high than the Mountain of Machu Picchu, the ascent has some degree of difficulty, not recommended for people suffering from vertigo. The Huayna Picchu Mountain is located between Km 82 and 122 northeast of the department of Cusco, in the province of Urubamba, Machu Picchu district. The Huayna Picchu belongs to the Historic Sanctuary of Machu Picchu and is north of the Inca City, and can be seen as the background of Machu Picchu in the photos of the enigmatic Llaqta or Inca City. You can climb to Huayna Picchu by a steep path, which begins exactly in the “Huayranas” sector inside Machu Picchu, where there is a well signposted path, from the entrance gate to the Inca City until you reach a control booth of entrance and exit of the visitors. The narrow path of climb includes stairways worked at the edge of the mountain walls. The Huayna Picchu Mountain is located in the middle of a jungle landscape, surrounded by lush vegetation with a habitat of birds, butterflies, insects and others, all belonging to a tropical landscape. The rock walls, which are found during the ascent, belong to the Batolito de Vilcabamba, and we are talking about the white granite. The climate is warm and temperate, during the dry season (from April to October), and with the presence of rains (from November to March), although Machu Picchu preserves its brightness and greenery all year round. And to crown the view, you can see from this point the snowy Salkantay (Sacred Apu of the Incas), as well as the Inti Punku or entrance to Machu Picchu from the Inca Trail. During the steep ascent, one can begin to enjoy the scenery and the panoramic view that exists from the mountain. 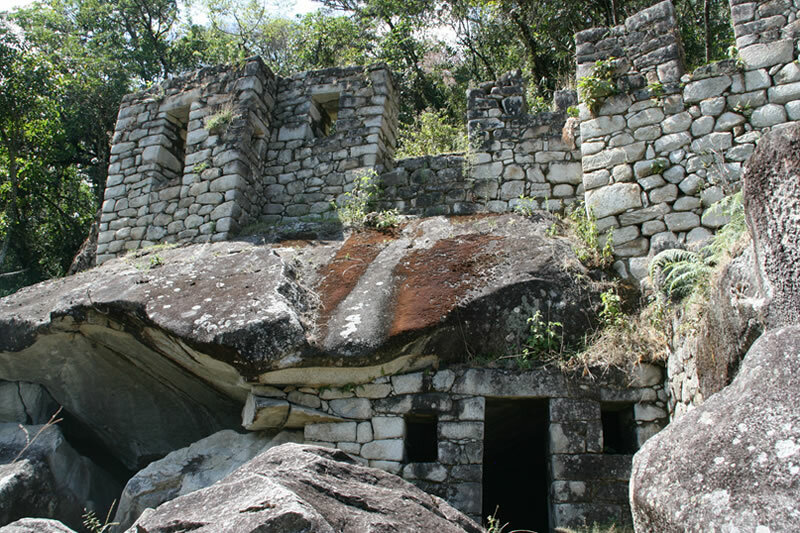 There are also large rocky outcrops, inside of one of the caves, there are walls, niches and lintels of trapezoidal style and fine stonework, belonging to the ” Temple of the Moon “. It should be noted that the Incas worshiped the Moon or Killa , and the existing Temple at Huayna Picchu is a sign of their beliefs. In this shrine, religious ceremonies were surely held around their sacred mummies. On the other hand, in the Huayna Picchu, you can see terraces and enclosures, forming part of a Control Site or Astronomical Observatory, this possible function is given, considering the strategic location of the Huayna Picchu Mountain. It should be noted that once the ascent begins, one can see quite a few precipices that are covered with much vegetation. The first group is recommended for those who have more time and can go one day earlier to the town of Aguas Calientes (Machu Picchu Pueblo) where Machu Picchu is located, since the average distance from Cusco to Machu Picchu is 3 hours and a half. First Group: 07:00 hrs. – 08.00 hrs. Second Group: 10:00 a.m. – 11:00 a.m. The first group is recommended for those who have more time and have a day to spend the night in Aguas Calientes, the day before their visit. The walk depending on the physical state of the person is 1 hour and 30 minutes one way and another both return. It is recommended, to be quite prudent when climbing the mountain and especially undertake the return very carefully, to avoid accidents. Yes, and it is the most recommended for people who do not have much time; In this case the most important thing is that you buy your ticket Machu Picchu + Huayna Picchu in advance and arrive at the town of Aguas Calientes or Machu Picchu town very early; This will allow you to ascend to Huayna Picchu in the first group, to descend before eleven and to enjoy Machu Picchu without problems; However, you can also visit the Inca city of Machu Picchu first and then ascend to Huayna Picchu in the second group, and after the descent continue with your visit to the Inca City. Doing your tour with us, guarantees an organization of your journey efficient and with enough time to enjoy everything that this historic and natural sanctuary offers. What is the difficulty of Huayna Picchu? It can be cataloged with moderate difficulty. It is an ascent of 300 meters vertical; Very steep, narrow and irregular stairs; It has some very narrow paths in which it will have to hold of soguillas to cross them; But in spite of all this, it is not really very complicated. Although it is not really dangerous, you will have to follow the signposted course at all times, looking for a way on your own or not following the marked trails could mean a very serious accident. It is not recommended if you suffer from vertigo as it will become very difficult since it is a slope with steps and very steep; The problem is that passengers who suffer from vertigo, usually do not stop being afraid. But you will always have the possibility of descending. April, November and December have a balance between not very cold temperatures and pleasant weather. May and October offer warm, quite pleasant climates and cool temperatures. June, July, August and September correspond in our opinion to the best months, the nights are cool, the weather is very pleasant and there is very little rain. The entrance to the Huayna Picchu mountain will be suspended from 01 to 15 April 2016; While Machu Picchu Montaña will be suspended from April 16 to 30, 2016. THIS WILL NOT AFFECT IN ANY WAY THE INCOME TO THE INCA CITY OF MACHU PICCHU. Located next to the Sanctuary of Machu Picchu, climbing the mountain of Huayna Picchu, is an experience that will certainly be worth it; In it you will find Inca buildings. Getting to the top is an indescribable experience, the view is wonderful. The entrance ticket to Huayna Picchu is not something that can be obtained separately, so you must make your reservation two months in advance by buying your ticket Machu Picchu + Huayna Picchu . In recent years Huayna Picchu has become one of the most sought after by visitors from all over the world, who want an unforgettable memory of Machu Picchu. The best thing would be to arrive only with the indicated (5 kg per person); However, if you brought others, you can leave your belongings in lockers, which you can find at the entrance gate of Machu Picchu. If you are encouraged to go up to Huayna Picchu, remember to buy your admission tickets in advance. Estimate the walking time at leisure, if you go in the first group, you will be able to photograph the City of Machu Picchu without much flow of people. Keep in mind, that during the rainy season the floor is slippery, you have to climb very carefully. Do not forget to bring sunscreen and repellent, as well as good anti-slip shoes, head protection and of course in rainy season carry a good raincoat. Finally, we must tell you that if you are in good physical condition or suffer from vertigo, it is advisable to opt for entry to Machu Picchu Solo.